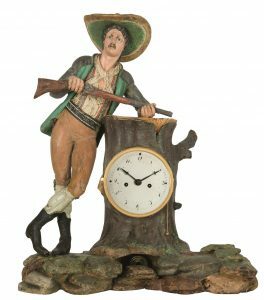 Figure clocks are a charming combination of a carved, polychrome mounted sculpture and a skillfully integrated clockwork. During the 18th and 19th century figure clocks out of wood have been made in Austria and Germany. Today they are rare and very sought after collector’s pieces.